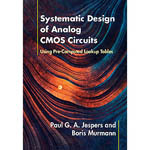 Discover a fresh approach to efficient and insight-driven analog integrated circuit design in nanoscale-CMOS with this hands-on guide. Expert authors present a sizing methodology that employs SPICE-generated lookup tables, enabling close agreement between hand analysis and simulation. This enables the exploration of analog circuit tradeoffs using the gm/ID ratio as a central variable in script-based design flows, and eliminates time-consuming iterations in a circuit simulator. Supported by downloadable MATLAB code, and including over forty detailed worked examples, this book will provide professional analog circuit designers, researchers, and graduate students with the theoretical know-how and practical tools needed to acquire a systematic and re-use oriented design style for analog integrated circuits in modern CMOS. 6. Practical circuit examples II.